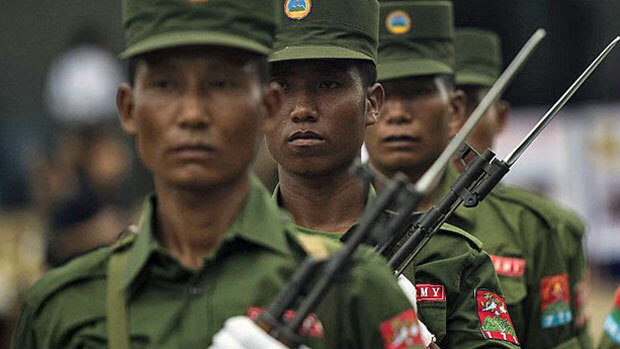 RANGOON, BURMA (BosNewsLife)-- Evangelical Christians in Burma say that the country's biggest non-state army is detaining some 100 pastors while conscripting Bible students into its ranks as fighters and destroying churches. The detentions and attacks by the United Wa State Army (UWSA), a 30,000-strong ethnic armed group, comes amid a campaign to suppress Christianity in self-declared free areas bordering China and Thailand, according to several sources familiar with the situation. Reverend Lazaru, a spokesman for the region’s ethnic Lahu Baptist community, told the U.S.-backed Radio Free Asia (RFA) network that the UWSA is now holding at least 92 pastors in Burma, also known as Myanmar. He cited witnesses who have fled UWSA control as his sources. “The UWSA has also forcibly recruited 41 male and female students who were taking Bible studies classes in various churches. And 52 churches in the Mongpauk area have been shut down, and three have been destroyed,” the pastor explained. As the areas under UWSA control are now cut off, “we cannot go there, and so we will hold a prayer ceremony on Oct. 7,” added Lazaru, who uses one name. “We have about 400 followers, and we’ll pray for the quick release of our brethren..."
It comes amid broader pressure on Christians by the China-backed UWSA, local sources claimed. On September 6, the UWSA warned that "all churches, missionaries, school teachers, and clergy members must face an investigation" and that a list of all churches in its controlled areas must be drawn up. Churches built after 1989—except for one made in 1992 with the government’s permission—must be destroyed, and new ones cannot be established, in what critics view as a measure to prevent people from converting to Christianity. The statement also prohibits ethnic Wa organizations or committees from becoming involved in support groups at churches and bans the teaching of religious lessons or beliefs at government schools. Additionally, it requires all religious leaders to be residents of the ethnic Wa region and to work only with permission of the Wa government under rules of UWSA headquarters. Rights activists say the order includes the Chinese term "jidujiao," which mainly refers to Protestant and evangelical Christians; not "tianzhujiao," used for Roman Catholics. "The use of such terminology suggests that the order may intend to target specific Christian groups," explained advocacy group Voice Of the Martyrs Canada (VOMC). "Under the decree, several church buildings were destroyed; mostly Baptist churches." The developments have also added to concern about the plight of Chinese-American Pastor John Cao who is serving a 7-year prison sentence in China after helping build 16 schools for the Wa people, an impoverished minority group in Burma, also known as Myanmar. "Hardly coincidental, this announcement follows increased international pressure to release Chinese American pastor John Cao," commented VOMC, adding that it urged its supporters to pray for "the persecuted Christians." It also comes amid international criticism that Burma's government of Aung San Suu Kyi, who won the Nobel Peace Prize, is not doing enough to tackle reported human rights abuses faced by Christian and other minorities. Besides Christians groups such as Rohingya Muslims suffer. Over the last year, more than 700,000 Rohingya Muslims fled Buddhist-majority Burma to neighboring Bangladesh after a military response to attacks on security posts by Rohingya insurgents. The United Nations has called Burma's actions “ethnic cleansing,” a charge Myanmar rejects, blaming Rohingya “terrorists” for most accounts of atrocities. Burma's government is also under pressure to allow more press freedom as two Reuters journalists remain imprisoned after reporting on the plight of Rohingya Muslims.